A Boeing 747-400 passenger jet can hold 416 passengers. This blog was viewed about 5,300 times in 2010. That’s about 13 full 747s. In 2010, there were 3 new posts, growing the total archive of this blog to 320 posts. There was 1 picture uploaded, taking a total of 34kb. The busiest day of the year was August 6th with 66 views. The most popular post that day was The Post – Extra! 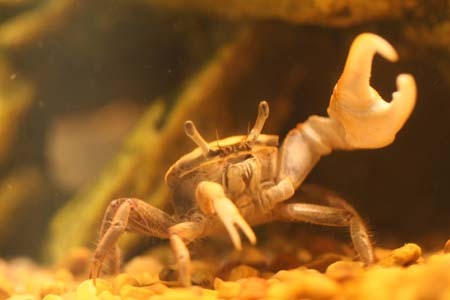 News on Preparing the Fiddler Crab Nursery. The top referring sites in 2010 were en.wordpress.com, google.com, search.aol.com, student-loan-consilidation.com, and mariaozawa2u.blogspot.com. Some visitors came searching, mostly for pregnant crab, pregnant fiddler crab, fiddler crab babies, faith is believing when common sense tells you not to, and pregnant crabs. I had about three other posts in mind for today. Each one flooded my brain though, making it impossible for me to find the “simple thread” at its heart. That means they’re meant for another day when my mind can absorb them and sift through the layers to the simple truth at their cores. Sometimes, what is not there, makes it useful. By clearing something away, you see what is waiting there to be discovered. As soon as I set these other topics aside, my eyes landed on what is meant to surface today. There is a book from the 6th century B.C. written by Lao Tsu, called the Tao Te Ching. The book is described as the essence of Taoism, contained in 81 chapters, which are more like 81 poems or pages because the entire book is about 5000 words. Don’t let it fool you. The shortest entries are the hardest to decipher. What is not there makes it useful. Entry Eleven is one I could actually figure out-at least most of it. We won’t discuss those last 2 lines whose meaning in view of the rest I still haven’t figured out. Michaelangelo said that the sculptures he did were already there, fully formed in the rock. He just released them by cutting away all that was not the sculpture. In photography, the photo’s essence is all about what to include and what to exclude. Even when you print the photo, it is often cropped first, to remove the things that don’t contribute the the unity of the photo. Leave in too much, and you dilute the power of what remains. I recently took an oil painting seminar on color theory. The artist, Caroline Jasper, shared her process of creating seascapes. She started with some photographs of boats docked in a small port town. Her next step was to make some quick sketches, deciding which boats and buildings to keep and what to cut. By eliminating the excess, what remained had power. Only then did she proceed to actually painting the scene. In writing, the same is true. Whether fiction or nonfiction – there is a slant, a premise, a particular viewpoint. By the very nature of selecting a perspective, some things will be excluded because they don’t support the main focus of that piece. If there is any process in writing where “what is not there makes it useful” it would have to be editing. It is the writing equivalent of cutting away the excess stone, cropping the photograph, deciding what elements stay in the painting and which are removed. If anyone doubts the importance of removing what is not needed, consider the Gettysburg Address experience. To remove the excess is to enhance the power of the creation. When I set the other topics aside, this one came up to be discovered. What was not there, made it useful.